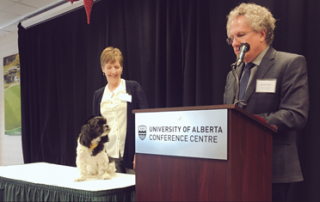 You may have seen Ruby the Science Dog on Twitter (@SciDogRuby) or around the University of Alberta, but did you know that Ruby is an EHS pet? Found as a stray and transferred to EHS from Animal Care & Control Centre in January 2014, Ruby (then Armani) was found to be a bit shy of new people and could be easily overwhelmed. She came out of her shell when adopted by her new family though, and found not only a new family, but a new career too! Since being adopted, Ruby has been working as a therapy dog at the University of Alberta Faculty of Science, providing support to students through group and individual sessions and work. Her family describes her as "an amazing dog who has a very special ability to support students and especially those with high anxiety." Now in her golden years at the age of 11, she retired this past November and was awarded an honorary "dogree" by the Faculty of Science to thank her for her service! Her family said they wanted to share their story to remind others "how important the humane society can be in both helping animals, but also the community at large." Congratulations Ruby and enjoy your retirement!